This weekend was a 3 day holiday and on Saturday we went to the Nishi Harima Astronomical Observatory in Hyogo prefecture with some friends. Although Hyogo prefecture has always seemed far from Kyoto, lying on the other side of Osaka, the traffic was fairly light and it only took just over 2 hours to drive to the observatory. The observatory is run by the prefecture and has accomodation for visitors in either a group lodge or family lodges. The organized star gazing is just from 7:30 to 9:00 when you get to have a brief look through their main telescope along with a large number of other people. You can also borrow a smaller telescope to use by your self. 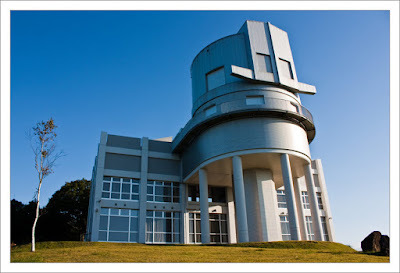 The main telescope is a 2m diameter reflecting telescope and is the largest in Japan. While it was certaintly interesting to see Jupiter and Uranus through such a powerful telescope, the whole event seemed not very well organized and was a bit dissapointing. Hands on experience with smaller telescopes with some expert instruction would have been much better than a couple of brief glimpses through the large telescope. 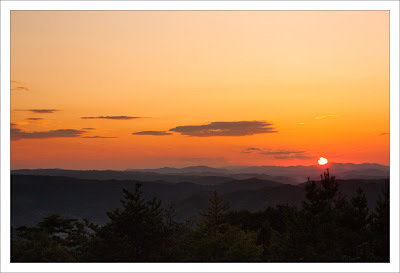 The best part of the trip for me was the chance to photograph the sunset and sunrise from the mountain top where the observatory is located. The light traffic meant that we arrived about 4 pm giving plenty of time to get ready for sunset at 5:45. Since the group lodge where we stayed was located at the observatory I could get up at 5:30 am and be ready for the sunrise at 6:06 am. I then spent the next 2 hours taking photographs before before breakfast. 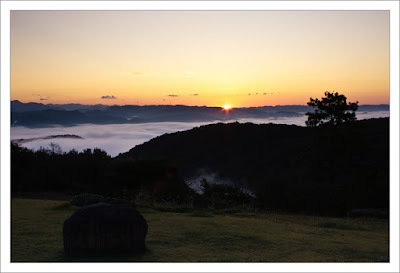 Although the observatory is located in the middle of nowhere, this is still central Japan so there are electricty pylons marching across the landscape. Trying to compose a shot without these was rather tricky so I have tried to remove some of them in post. Looks fun. 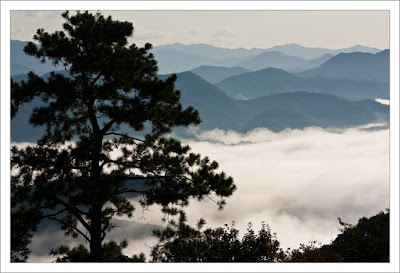 "Mist in the valley" is amazing. 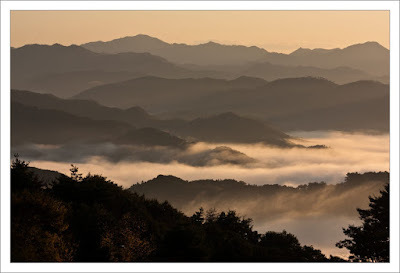 Hyogo might seem far away, but there are plenty of places in Kyoto Prefecture that are even farther.... Kyoto Prefecture goes way north and west, all the way to the ocean. The observatory is on the far side of Hyogo, itself huge (the biggest prefecture after Hokkaido, landwise), so it's further from you than any point in Kyoto Prefecture, but only by a sliver. Takng pictures in the eary morning was fun. It was easy to blow out the highlights with all the white mist. When I first visited Japan, in 1993, we had a trip up to Amanohashidate. But that was a long time ago. The main problem I find is traffic jams on the roads, so it takes an hour to do 10km. That has always puts me off driving. I did not know Hyogo was so big.